Is there really trouble between the couples? Teen Mom OG premieres tonight (! ), so over the last few weeks, the tabloids have been running wild with stories about the show’s stars. One story that seemed to pick up quite a bit of traction over the last week was the story released by In Touch Weekly that claimed that Catelynn Lowell and Tyler Baltierra were battling with Brandon and Teresa Davis, the couple that adopted Ty and Cate’s firstborn daughter, Carly, back in 2009. The tabloid stated that the relationship between the couples was “really strained” and that Brandon and Teresa have “threatened to cut off contact” between Carly and the ‘Teen Mom’ stars because, as the magazine states, Cate and Ty are not following “the adoption rules” regarding posting photos of Carly to social media. While Catelynn and Tyler have confirmed that their relationship with Carly’s adoptive parents will be discussed and examined in the new season of ‘Teen Mom,’ both have slammed the reports that they are being cut off from contacting Carly. In a series of tweets, Catelynn, Tyler and their adoption counselor, Dawn Baker, have all denied In Touch‘s claim. When fans, who believed the tabloid story, tweeted to Tyler that Brandon and Teresa should “lighten up” and that Cate and Ty have the right to post photos of their own daughter, Tyler was quick to defend the couple he is supposedly battling with. “No! This is not true or the way an open adoption works. B & T are Carly’s parents NOT me & Cate,” he tweeted to a fan. Although it is not yet known whether or not the couple will appear on the new season of ‘Teen Mom,’ it’s likely, as Catelynn mentions in this interview that she had an uncomfortable conversation with Brandon and Teresa while filming. (It may have been on the phone, however.) She also confirmed to People that the new season will focus in part on their relationship with the North Carolina couple. “People will see that in the show too – us navigating our relationship with [Carly’s adoptive parents] Brandon and Teresa, how [our second daughter] Nova comes into play, all that kind of stuff,” Catelynn told the magazine. Catelynn and Tyler last saw Carly in November 2014, during their scheduled visit. During the visit, Brandon and Teresa gifted the couple with a few outfits that Carly wore as a baby. Catelynn and Tyler planned to give the clothes to Nova, who was born in January. Brandon, Teresa, their adopted son, and Carly on the magazine cover in 2012. Many fans have been critical of Brandon and Teresa; however, The Ashley wants to point out one thing: The couple had no idea that Catelynn and Tyler were going to be on 16 and Pregnant when the plans for them to adopt Carly began (despite how it looked on TV). Also, they were part of the show’s first season, and most likely figured that this would be a one-off episode. No one had any clue at the time of filming that the show would become so popular, or that Catelynn and Tyler would go on to star on five seasons of ‘Teen Mom.’ To sum it up, they really didn’t know what they were signing up for in terms of having such a public adoption. 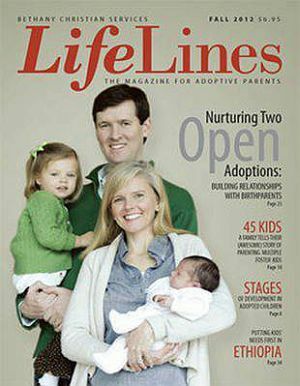 In fact, Brandon and Teresa commented about this in an interview with adoption magazine Lifelines in 2012. (The Ashley painstakingly transcribed that interview for y’all.) Teresa discussed how difficult it has been for her and Brandon to watch (via the show) Cate and Ty struggle with their adoption decision. “In retrospect, we are glad that they were part of the show,” he said. “We are thankful that it has really given Catelynn and Tyler great purposes in life. ‘Teen Mom OG’ premieres tonight! Click here to watch the trailer and, of course, stay tuned for The Ashley’s recaps of the episodes! what a mess that has become. Carly will be affected by ALL of it going forward, who could she not? Hopefully she doesn’t fall victim to any substance abuse issues. I think Ty and Cate regret giving her up. After all, all the Teen Mom and Teen Mom 2 get their children, none of them were in much better of a place than these two. Some of them have very toxic and dysfunctional families, yet they all kept their children. Ty and Cate, had plenty of money well before Carly was 1. They would have done a fine job, and I think they both know that, but never said it, because they were getting paid by Bethany Christian Services to speak about how wonderful adoption is. MTV checks were absent for a few years, that’s how they supported themselves. These two never graduated from college and are basically lazy losers. They are now 23, no excuses they didn’t raise a child, had money they could have gone and never bothered, contrary to all the talk they put out there. NOT IMPRESSED. By the time they went to the first visit with Carley, they had plenty of money, they were rich and famous. Also Tyler has a decent mother in Kim, April and Butch would have helped them the first year. AS dysfunctional as they are, they would never have turned their backs on Cate. Amber had a horrible dysfunctional life, both of her parents were addicts, she was living in an apartment with Gary who was unemployed a lot of the time, and she kept Leah, Farrah has the Adam’s family that raised her. Jenelle has a mother that seems to be mentally slow and works a minimum wage job, really few of these girls had anything any better than the two of them, they regret it, it’s very clear to me and many others, they regret giving her up. When they traveled to New York to visit her, they had the best of everything by that point, new cars, nice place to live, plenty of money, it was a huge mistake giving her up, and they both know that. sounds to me you would be an excellent person to choose adoption if you ever get pregnant. let’s all hope you do. I hate to think of your poor child suffering by living with you it’s entire life. I don’t know why people are even trying to fight Tyler & Catelynn’s battle. It’s probably not even a battle they want to have. People have disagreements and obviously Tyler & Catelynn have had some with Brandon & Teresa but that doesn’t mean they can’t move past them. Let it go, people. so it’s not ok to post pictures of Carly, but it’s ok to be on the cover of a magazine? they chose open adoption, and i’m sorry but open means open. however worried they are now Carly’s going to grow up knowing they are the parents who raised her and nurtured her, and Cate&Ty are the birthparents who made it possible for her! What a ridiculous comment. Brandon and Theresa can be on the cover of a magazine with Carly because she’s THEIR daughter. She is not Catelynn and Tyler’s daughter anymore and they do not have the right to post photos of her without Brandon and Theresa’s consent. Even Tyler acknowledged this. Don’t be so naive to think you know all the rules and regulations to adoption and the people who actually went through the process do not! This all goes without saying. On paper they are the legal parents and they call all the shots and there’s no arguing that. Carly is legally their daughter and they can do what they want. On a human relationship level however, it’s totally hypocrital of them to forbid C & T from posting photos of Carly and then turning around and putting her on a magazine cover. But hey, they’re the legal parents and are free to be hypocritical control freaks if they so choose! Exactly. If I was in Brandon & Theresa’s shoes I would feel the same way. You are protective of your children and other people posting pics without your permission is not okay. Just because Tyler & Catelynn are her birth parents, doesn’t mean they have the right to do that. Brandon & Theresa raise her. Carly is their daughter. I have a feeling C&T are saving face. After seeing the “This season on Teen Mom OG” montage it definitely seems like Brandon and Theresa had to put C&T in line about their role in Carly’s life. I think Theresa even said to them “You are not her parents, we are.” so now that C&T are parroting that…yea, I’m suspicious. And in support of the magazine article…I think there’s a huge difference between posing for a magazine and talking about the struggles of an open adoption and the struggles of it playing on on TV versus sharing intimate photos. C&T are getting candid, intimate snapshots of Carly’s life and THAT’S what Brandon and Theresa don’t want on social media.